I defined scarcity and abundance and demonstrated how the two mindsets may have a massive impact on separation and divorce by using some yummy pie scenarios. 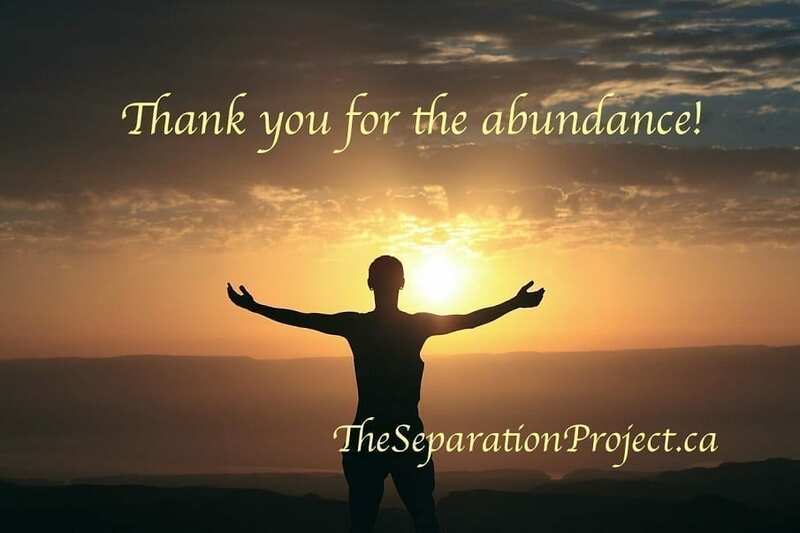 You can read the post here: Scarcity and Abundance: Can your Mindset Impact your Divorce and Separation? The end of a love relationship is normally thought of a time of negativity and scarcity, but if you can change your mindset to be abundant – even slightly – it really is helpful to change the common sense of overwhelm into something more manageable. An abundance mindset is really a habit you need to encourage every opportunity you get! Caution: Do not expect your divorce will be all rainbows, flowers, and unicorns, but thinking about things a little less negatively will start things spiraling up in a better direction. Abundance is not just positive thinking – it is a different perspective or paradigm of the situation. Abundance really does encourage action because more possibilities will come to mind when you are open to them. Abundance is ENOUGH, not excess. If you feel like you should have MORE, take a deep breath and examine your situation honestly. I find most people during and after a divorce try to hold on to 100% of what they had while married – often stuff they didn’t even like! Most people divorcing will get a reasonably fair agreement, but almost everyone seems to feel like they got the short end of the stick since they don’t have their 100%. There are a lot of losses during a separation and divorce. You and your ex may both have many losses and despite that, the settlement is probably fair. The number most often quoted is that you should get about 1/3 – 1/2 of the assets. Accepting that fact and feeling like you will have enough and that you do have enough right now makes you much more relaxed and less stressed immediately. Enough will be defined differently for everyone and we all have a different starting point. Most of us really will have ENOUGH. Constantly repeating your divorce story, that you got “LESS”, to yourself and others will drain both your happiness and your energy and keep you firmly stuck in scarcity thinking. If you feel abundant you are more likely to act fairly and receive fair treatment in return. Not feeding into the usual fighting and common struggles that are common in separation and divorce is a big win and usually, leads to much more cooperative behaviour on both sides. Thinking abundantly improves everything immediately, especially for any children involved as co-parenting becomes much easier with cooperation between the parents. Divorce can be a bit like playing dodge ball – if there is only one ball to fire back at your opponent and you choose not to throw it, they cannot throw it back at you so the game is over. Think about the possible benefits of not returning any dispute ammunition and responding in a different way instead. I am not saying giving up your rights – just trying another approach to the situation. Abundant thinking allows you to realize that the piece of pie you do have, your assets, is a good start and then you can get busy. You can find more pie, create more pie or decide you want something other than pie. We all have different ideas on what we want in life! Abundance allows you to see a new beginning full of possibilities lies ahead of you – this is much more fun in the long run than a pity party! Scarcity, on the other hand, is like being in a big hole or pit – you cannot see what is available on the edge of your pit from inside the pit. It actually becomes easier to make the pit bigger and deeper rather than climbing out of it for a more abundant view of things. Scarcity will feed on more scarcity and it may lead to a great deal of unhappiness and spiraling down into depression. A pity party doesn’t benefit you and really is not a lot of fun. Have a good understanding of your legal rights and your ex-partner’s legal rights. Have a realistic sense of your contributions and your ex-partner’s to the shared marital assets. Not every asset is measured in dollars. Time, energy and things like staying home with children while one partner focuses on their career are big contributions to any family. Have a sense of what you own and owe together and how it is normally divided so you know what to expect. You deserve to be treated with respect and so does your ex-partner. Give respect and expect respect. Know what is fair. Expect fairness and be fair. Often people get locked into what they want. Take a step back and re-evaluate if you really are being reasonable and fair. Is there another way to divide up things? Sometimes one item can become a big sticking point – how can you please both of you and still be fair? Approach divorce in the here and now; past regrets and future worries should not be involved. No one has a guarantee of what will happen in the future, especially divorcing couples. Do not use a divorce settlement as revenge. Remember that your divorce story is irrelevant to the business of divorce. In Canada, we have a no-fault family law system. A court will just cost you more to divide up the assets – not divide them up so anyone can feel superior or punished for behaviour during the marriage. Show appreciation – it makes everyone feel slightly better. There is nothing wrong with thanking your partner for what you do get! Look for the positives even in the losses – and there are always positives! It may take a while to recognize the gains but there is always at least a good lesson in every difficult situation we navigate in life including a lost love relationship! Believe there is enough for everybody. Practicing an abundant mindset can be very freeing! If you are thinking about separating, in the middle of a separating or divorcing, or divorced many years ago, an abundant mindset will help your situation. I can help you manage your overwhelm! I do offer a free strategy session. This is really very tough to maintain during divorce but I am happy that unlike other spiritual soothers, you have got a very realistic approach of not ignoring basic facts and to try to rise above from the bitterness that the situation presents. Though very tough but a worthy goal to achieve. Thank you Dan. I appreciate your thoughtful comment. You are right – it is very hard, especially during a divorce, to remain in an abundant mindset but it does help. Positive thinking is not all it is made out to be by some – you also need the right perspective and the right actions! Never knew abundance also sneaks itself in relationships. This is really an eye opener. Thanks a bunch. Thanks for reading! Abundance and scarcity show up almost everywhere. Email me your blog updates! Separation Mistake #3: Giving all Your Power Away to Your Now Ex-Partner. New Year – Need New Divorce Goals?